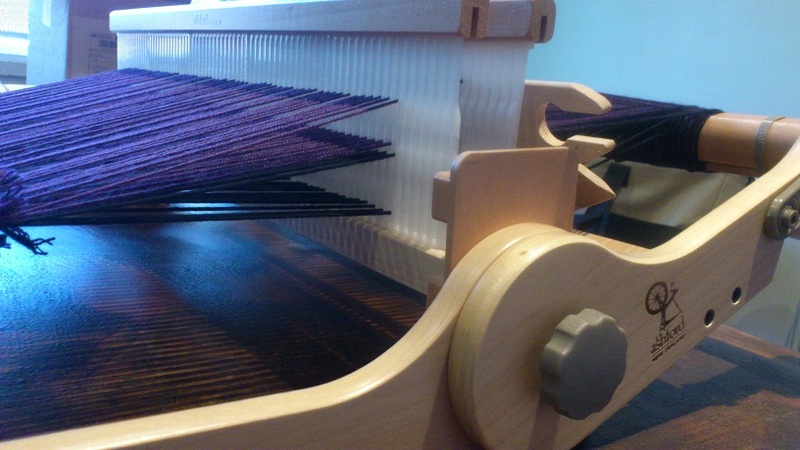 What happens after you put a second heddle on a rigid heddle loom? The double weave calls to you! Double weave is one of the more literally named techniques in that you weave two layers of cloth at the same time. Yes, you read that right – two layers of cloth! 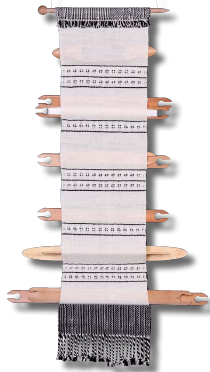 Now, if you’re scratching your head and going “why is that exciting?” then consider this; it means you can double the width of the cloth your loom creates, and it means you can weave tubes or weave open and closed sections (pockets) like in this example of a shuttle holder from the Ashford’s double heddle instructions. The bottom shed is black and the top shed is purple and I’ve got both of them open so you can see how one sits above the other. When you weave you weave one set of threads at a time. So, if you want to create a double-width fabric you use one shuttle and weave top layer / top layer / bottom layer / bottom layer. 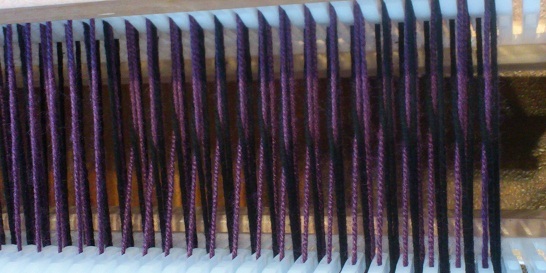 This means your weft joins the two layers together on just one side. To weave a tube, you change the order to be top layer / bottom layer / top layer / bottom layer and your weft will join both edges. 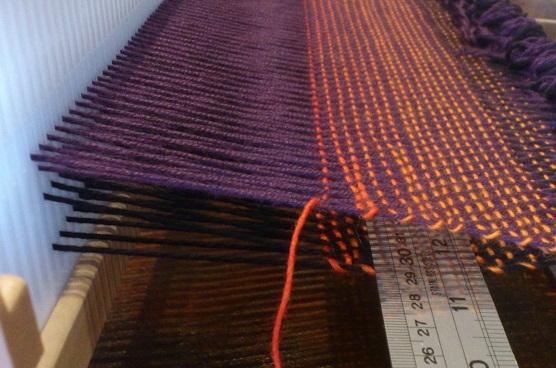 You can weave two separate layers of cloth, by using two separate shuttles. To create pockets like in the picture above, you alternate two separate layers of cloth with sections where you treat your two heddles as one, to get a single layer of very dense cloth. So, how does this magic happen? Each reed/heddle controls one layer of cloth, but you need 4 shafts (equivalent of an up-shed and a down-shed for each layer of the cloth) and that’s the reason for the pick-up sticks in the image of my loom. You need to move the slot threads with pick-up sticks. This is because you need to get the slot threads for the layer you’re weaving away from the slot threads of the other layer, remembering on an RH loom only the threads in the holes actually move. Obviously, on a multi-shaft loom you would just thread 4 shafts. I’d say the only tricky bit of double weave is the threading, because you have to get the right threads in the front and back holes. And it’s easy to make mistakes. You can see here I crossed a bunch of my threads and this will stop you getting a shed. I realise this post probably does make it sound complicated, but honestly, once you do it you’ll find it’s not really!